While Republicans on Capitol Hill attempt to rein in food stamps and roll back some of the healthier-school-meals rules that have been put in place during the Obama administration, Agriculture Secretary Tom Vilsack is organizing a new effort to curb childhood hunger and improve nutrition in some of the poorest areas of the country. In an interview Wednesday, Vilsack talked about new grant programs he is unveiling this month, portraying this push as a comprehensive campaign to make sure the next generation of American children is well educated enough that they can work smartly and spend their lives doing something besides buying imports from China. "There is a reformulation of the American economy taking place in which we are moving from a great reliance on consumption to a more balanced approach between what we can make, create, and innovate and what we consume," Vilsack said. "That kind of economy requires all hands on deck. It requires the future generations to be prepared." "We have kids who want to participate in that economy, but they are not going to be able to if they are too hungry to learn, or they are concerned about their weight and their self-image such that they just aren't paying attention to the science and get discouraged. Nutrition is linked to success." But amid the lofty rhetoric, Vilsack also said he is afraid House Republicans may want to fit the food-stamp program—formally known as the Supplemental Nutrition Assistance Program—into an "arbitrary" budget number and to provide schools with "flexibility" that could lead them to stop serving meals that are lower in fat and sodium and include whole grains and fruits and vegetables. Vilsack made it clear he is proud that the Obama administration has increased the percentage of people eligible for SNAP who are getting benefits from 72 percent to 83 percent, and that the Healthy, Hunger-Free Kids Act of 2010 promoted by first lady Michelle Obama has improved the quality of school meals. "Clearly, steps have been taken in the last six years to not only reduce childhood hunger but also to improve the nutritional quality of the meals of kids who are getting help," Vilsack said. Those steps—including increasing access to SNAP, improving school meals, and updating the kinds of foods that low-income mothers can buy through the Supplemental Nutrition Assistance Program for Women, Infants, and Children, known as WIC—have addressed candidate Obama's 2008 campaign pledge to end childhood hunger by 2015. But Vilsack acknowledged that there are still gaps, particularly in rural areas, and he said he hopes some new initiatives will help. This week, Vilsack announced $27 million in five grants to try new ways to reduce childhood hunger. The Chickasaw Nation, an Indian tribe in Oklahoma, will provide food through home delivery to households with children who qualify for free school meals. Kentucky will test providing households with children an additional transportation deduction that may increase their SNAP benefits. The Navajo Nation, which extends across Utah, Arizona, and New Mexico, will evaluate gaps in food access in remote rural areas. Nevada will test the effect on SNAP households with children of an increase in benefits and an increase in benefits plus additional education. Virginia will test the impact of providing three school meals per day to all children in some schools, providing food for weekends and school breaks, and providing resources for low-income households to buy food in the summer, when children are not getting fed in school. 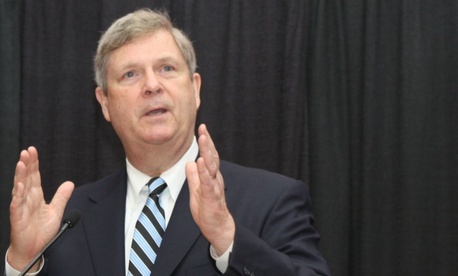 On Friday, in San Antonio, Vilsack will announce grant funding for school equipment, which he hopes will reduce the complaints from some school food-service directors that they don't have the equipment to prepare healthier meals. Most of the schools that have complained are in rural areas, Vilsack said, adding that he believes he can pair schools that have succeeded with struggling schools so they can make the changes they need. Later this month, Vilsack will announce an increase in summer school-feeding grants to increase the total number of summer meals served to children from 187 million in 2014 to 200 million in 2015. And, perhaps most importantly, Vilsack will announce grants to 10 states to help SNAP beneficiaries find work. Those grants were included in the 2014 farm bill in reaction to Republican demands that ways should be found to get people off SNAP. "People who are able-bodied want to work. They may have barriers in transportation, lack of training," Vilsack said. "This is the right way to reduce the cost of the SNAP program," he said. House Agriculture Committee Chairman Mike Conaway of Texas has begun a "top-to-bottom" review of SNAP that he says may last several years. Vilsack said those hearings have been "respectful," but he fears that Republicans who don't serve on the Agriculture Committee will focus only on how to save money. Vilsack's self-styled "comprehensive approach" can be dismissed as just a bunch of grant announcements packaged together during National Nutrition Month. But the real value of his campaign so late in the Obama administration may be to energize the antihunger and nutrition advocates who worked so hard to pass the Healthy, Hunger-Free Kids Act and to defend SNAP in the farm bill. The advocates were demoralized by successful Republican attacks in the 2014 elections and now face tough battles on Capitol Hill. "There is a success story here," Vilsack said. The Agriculture Department is prepared to address problems in SNAP and in the schools, he said, "but we ought not to be sacrificing the progress that's been made. This is an effort to make sure every kid is prepared to be contributing to this incredibly transforming economy."